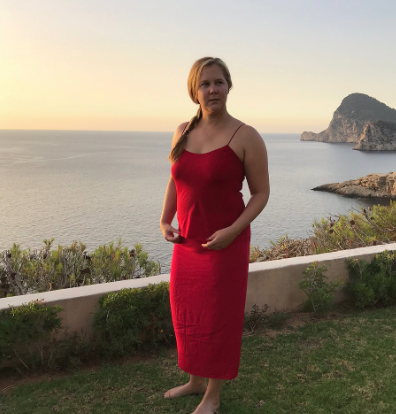 –Amy Schumer is shooting down pregnancy rumours — though this photo and caption seemed designed to bait the belly bump watchers. -You’re internet boyfriend Michael B Jordan might be dating someone who isn’t you. Sorry. -Some of the house built by Brad Pitt‘s Make It Right foundation in New Orleans following Hurricane Katrina reportedly need some work. -The Emmy nominations this morning delivered a few happy surprises: Tatiana Maslany (Orphan Black) snuck in over Emilia Clarke (GoT), Sandra Oh became the FIRST Asian woman to earn an Emmy nomination for lead actress drama, The Unbreakable Kimmy Schmidt edged out Modern Family’s spot (finally!! – though I wish Better Things or The Good Place had taken over Curb Your Enthusiasm’s spot). And most importantly, Megan Amram got her nomination!! -Most of the nominations were kind of meh, though. I liked this take on how it was the triumph of “ok” TV. -This is the first time in 18 years that HBO has not led all TV networks in noms; instead Netflix is now leading the way. –Will Smith and Kelly Ripa took on the “In My Feelings” challenge. –Mira Sorvino says she lost a role after an unnamed Oscar-winning director sexually harassed her. -A top executive has left Billboard after being accused of suppressing stories about sexual harassment. -Stranger Things’ Joe Keery and Maika Monroe nailed the Dirty Dancing lift. –Saoirse Ronan and Margot Robbie reign supreme in the Mary Queen Of Scots trailer. -I don’t know why Jason Segel posing in front of tiny doors in England is so funny to me, but it kind of us. -Why is Kate Hudson still able to command major mag covers? WHY??? –Amy Schumer left a $500 tip for a college student on an $80 bill. -A new adaptation was announced of Lord of the Flies with women, but written by men. The internet is not amused. –Taylor Swift’s concert cash-grab scheme is yet another big blow to her Reputation. -Agent’s of S.H.I.E.L.D.’s Chloe Bennet went off on a commenter who questioned why she changed her Chinese last name, saying “Changing my last name doesn’t change the fact that my BLOOD is half Chinese, that I lived in China, speak Mandarin, or that I was culturally raised both American and Chinese. It means I had to pay my rent, and Hollywood is racist and wouldn’t cast me with a last name that made them uncomfortable. I’m doing everything I can, with the platform I have, to make sure no one has to change their name again, just so they can get work. So kindly love, f— off.” The more I hear from this girl, the more I dig her. -In what universe did The Wrap think it would be ok to rank TV actresses from most to least liked? –Kim Kardashian covers the September issue of Harper’s Bazaar Arabia, in which she says “I feel in my soul I’m a feminist. I just don’t need labels to make me feel or know what I am inside.” Groan. -New Girl’s Hannah Simone and hubby Jesse Giddings welcomed their first child earlier this month, a baby boy. -CW premiered Vixen last night and is now complaining that nobody watched it. What the hell? If I had known about it I totally would have broken my no-TV summer. Blame your promotions department, not us. -I really liked this article on Chris Pine and Hollywood’s evolving masculinity. –Vince Vaughn gets angry in the Brawl in Cell Block 99 trailer.